The latest proven science for canine joint care is now in a soft chew that your dog will love. Osteo-Pet Total Joint Care Formula for dogs is now available in a bacon and cheese flavored soft chew. Vitamin C for dogs may sound redundant, because unlike humans, dogs produce their own. But, during stressful times like injury, pain or joint cartilage damage, it's beneficial to offer your dog a backup supply of antioxidants like Vitamin C.
Essential Fatty Acids for Dogs can help decrease painful inflammation in joints. EFAs can also help improve the luster & shine of your dog's hair, skin and coat. Boswellia for dogs works as a natural anti-inflammatory to help reduce swollen joint inflammation. New! Osteo-Pet Total Joint Care is Now in Soft Chew Form! 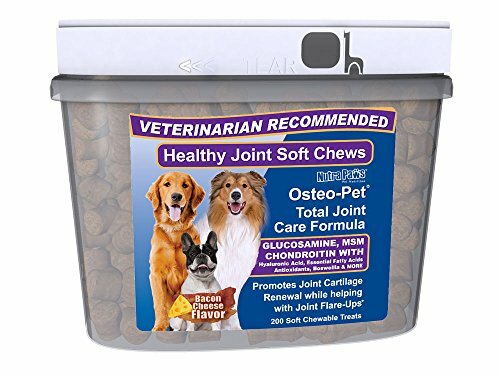 Glucosamine Chondroitin, MSM, Hyaluronic Acid, Green Lipped Mussels, Collagen, Vitamins C & E, Boswellia Seratta Extract and Omega 3 Fatty Acids in a soft chew formulated for Dogs. Provides Natural Ingredients Shown to Help Rebuild Damaged Cartilage in Dogs. This Is The Most Comprehensive Joint Formula For Dogs Available. Dogs Love These Bacon & Cheese Flavored Soft Chews. Osteo-Pet Supplements are Proudly made in the USA. If you have any questions about this product by Osteo-Pet, contact us by completing and submitting the form below. If you are looking for a specif part number, please include it with your message.